The bust of Mileva Maric, Serbian scientist, was unveiled in the Serbian Cultural Garden within the Rockefeller Park in Cleveland, Ohio. Mileva Maric was the first wife of Albert Einstein. The initiative for the placing of the bust was initiated by Alex Machaskee, Honorary Consul of the Republic of Serbia in Ohio in cooperation with the Diaspora Department at the Ministry of Foreign Affairs of the Republic of Serbia. 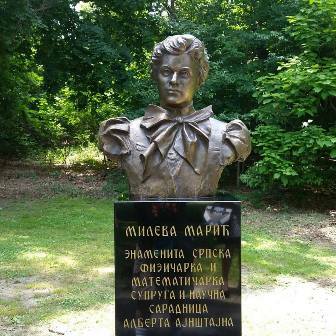 The bust of Mileva Maric was sculpted by sculptor-academic Ivan Felker. The opening ceremony was attended by Djerdj Matkovic, Serbian Ambassador to the USA. At the Serbian Cultural Garden in Cleveland are also memorials to Saint Sava, Petar Petrovic Njegos, King Peter Karadjordjevic, Vuk Stefanovic Karadzic, Stevan Mokranjac, Mihajlo Pupin and Nikola Tesla.